Many times in early childhood education, a child’s age in Years.Months format is needed for reporting, admitting, and evaluation. Basically, this format shows the number of elapsed years and months since birth, separated by a period. Let’s say that you have a folder on your hard drive that contains thirty text files, and you want to import all of them to an Excel workbook. You want each text file to end up on its own worksheet in the workbook, so that you will have a total of thirty worksheets. Want a really quick way to clear the cells in a range you’ve selected? How to use the feature built into Excel that provides the ability to automatically capitalize days of the week if you enter them in a cell. How one of Microsoft Excel’s most obscure functions can make your life easier. Learn how Excel can catch mistakes caused by Cap Lock being left on. 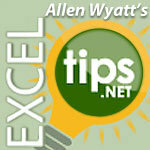 Excel provides a pair of nifty shortcut keys that can be used to copy cells down and to the right. How to sort Microsoft Excel data containing merged cells. David has a footer with the page number—which is helpful—but it would be great if he could have, in the header of each page, the first name on the page and the last name on the page.